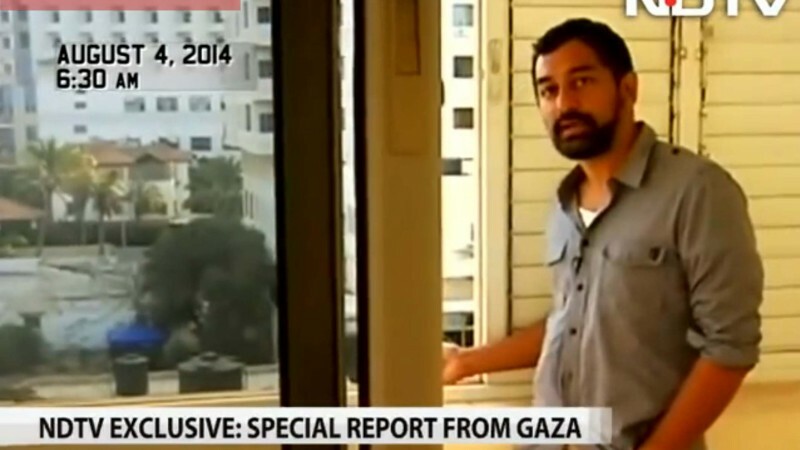 A video report from NDTV showing Gazan militants firing a rocket towards Israel from within a residential area earned the Indian broadcaster attention around the world earlier this month. It was one of the first times throughout the now six-week-long bombardment of Gaza that a major news outlet had captured the assembly of a rocket launch site on film, and the footage was quickly touted by the Israeli government and its supporters. Fairly soon after it aired, it was distressing to find that the story had become Israel's ‘I told you so’ moment, an independent endorsement proof. In their eyes, that the media has finally acknowledged Hamas's dubious military tactics (the video was shared on the Israel Defence Force's social media platforms; it was also featured as a brief clip at a Netanyahu press conference). In turn this provoked sharp reactions from (some of) those sympathetic to the Palestinian cause, who accused us of ‘betrayal’. Just four days back, they praised us for our report from Rafah in south Gaza where the hunt for a so-called missing Israeli soldier had unleashed carnage. (The IDF did not re-tweet or ‘like’ that report). At least 2,000 Palestinians have been killed, more than 10,500 injured, and 520,000 displaced since Israel launched a massive offensive called Protective Edge against the 40-kilometer-long congested strip on July 8. Israel says the assault is targeting Hamas, a group that has ruled Gaza since 2007 under a seven-year blockade from Israel, for firing rockets across the border. Since the offensive started, three civilians have been killed in rocket attacks on Israel and 64 Israeli soldiers have been killed in fighting in Gaza. Other armed factions are operating in Gaza, such as the Palestinian Islamic Jihad and the Popular Resistance Committees, and have claimed responsibility for rocket attacks against Israel. We know that compared to Israel's firepower, Hamas's rockets are a minor threat. Of the almost 3,600 fired so far, only 10% have posed a serious risk to Israel's cities and have been taken down by its Iron Dome response system. The rocket we saw, in all probability, must have been the one of the 1000s that landed in open areas. But by firing these rockets from civilian areas, they threaten the people of Gaza more than anyone else: that was the simple point of this report. Srinivasan also took part in a live chat answering some of the questions from viewers. In India, public sympathy is high for the heavy casualties in Gaza, but there is also a feeling that a country has the right to protect itself. The country's government has balanced its stance of supporting the Palestinian cause with maintaining good diplomatic relations with Israel. The NDTV report generated much discussion on India's social networks, especially in Twitter. @smitabarooah @ndtv Balanced view? Precision guided missiles from air to burn sleeping children, sharpnels to blow their scalps of infants.. The sham that is Indian News is brought out by the fact that no channel, Hindi or English, has spoken of @ndtv‘s Hamas rocket launch story. To let this fear cripple our work would amount to erasing the difference between journalism and propaganda. Aparna Ray contributed to this post.